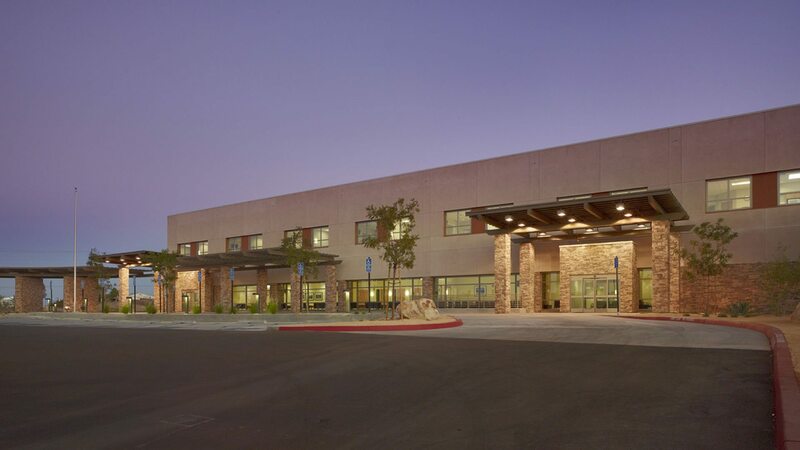 In a rural community on the Mojave Desert, a nearly century-old hospital was replaced with a new 82,000 square foot, 30-bed facility. Community Health Systems contacted the architectural team of TMP and Lee, Burkhart & Liu to design a modern replacement hospital based on smart simplicity and sustainability for future growth potential. Partnership with California firm, and architect of record Lee, Burkhart and Liu enabled TMP to focus exclusively on the healthcare planning and interior design aspects of the project. Special design considerations to comply with the site’s high seismic zone and California’s strict seismic codes. Generous amounts of glass used on the north façade to provide the main lobby with ample indirect daylight, with punched opening windows and sun shades used on the south side to reduce heat gain and avoid glare. A windbreak at the Emergency Department designed to shield the entrance from the high winds that routinely sweep across the site. Native soils along with minimal landscaping strategies used to reduce the ecological impact on the delicate desert conditions. Design references to the architectural traditions of the region and a revitalized presence in the small desert town of Barstow.